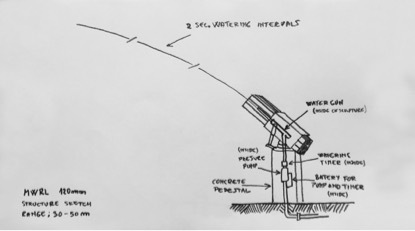 Multiple Water Rocket Launcher 100mm (MWRL 100mm) is a direct intervention that seeks to question how to reconcile place and form. 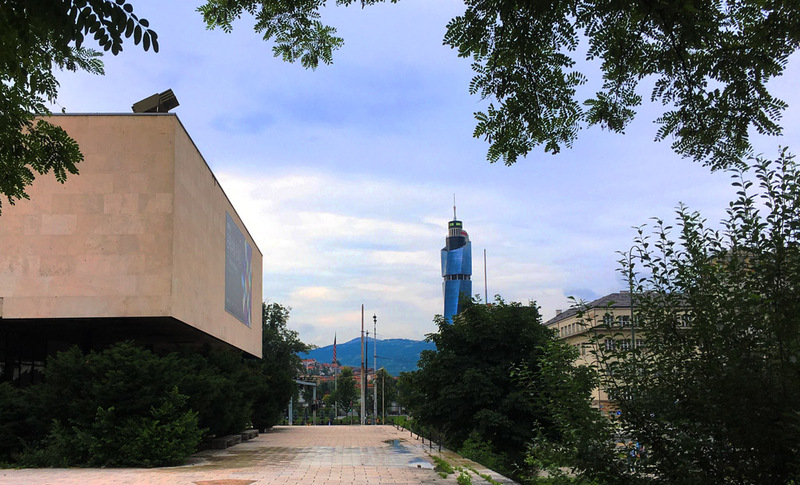 It is inspired by the contested space of the former military barracks – built during the Austro- Hungarian empire and used in the last war by the Republic of Srpska and previously by the Yugoslavian army – which is now an art school. Miljanovic wants to explore how art can reconcile opposites and practically support societies going through transformation. With MWRL 100mm he explores the role of the artist in constructively deconstructing, decontaminating and reconstructing spaces. The intervention is a micro experiment in how artistic strategies can be used to support wider social healing and reconciliation. Mladen Miljanovic lives and works in Bosnia-Herzegovina as artist and professor at the Fine Arts Academy of Banja Luka. 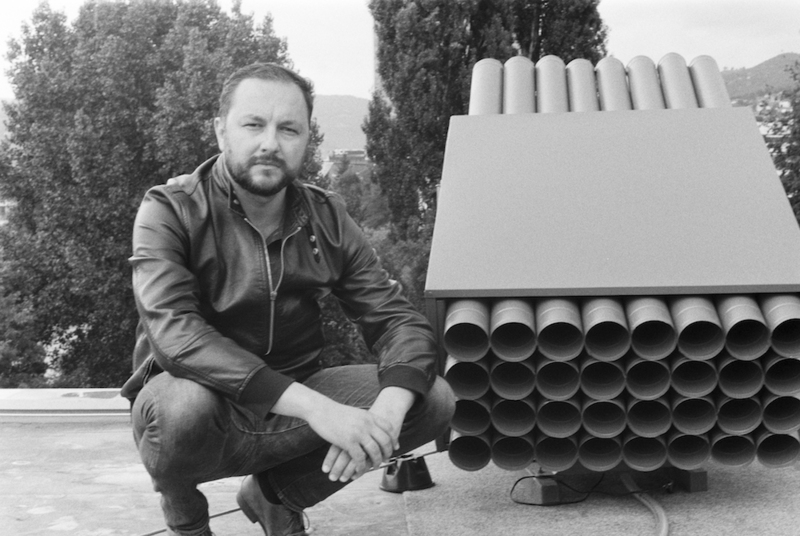 For this commission, he has built Multiple Water Rocket Launcher (MWRL 100mm) that will be permanently housed as a public sculpture at the ex-military base Vrbas (now the Academy of Arts, Banja Luca). The MWRL 100 mm is constructed out of drainpipes and gutters re-purposed from the main buildings in the former military base. It is designed to shoot water at 2-second intervals at a range 30-50 m onto trees and plants, cultivating the garden on the site. 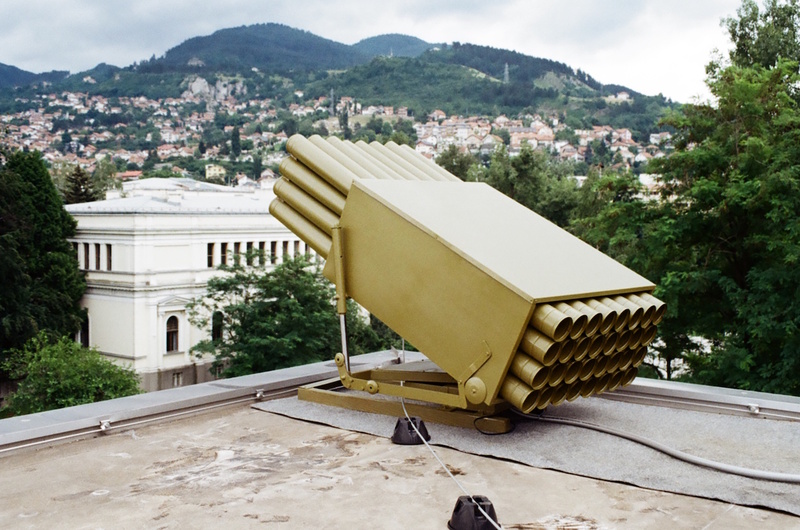 The design and installation of MWRL 100mm was undertaken in collaboration with an active Captain from the Bosnian army (who developed technical drawings and sketches for the installation) and a landscape architect who helped to incorporate the watering system within the rocket launcher sculpture. Installation simulation at the botanical garden on the site of the ex military base Vrbas, Banja Luka. The production process was made up of two stages. First the gutters were taken down from one of the main buildings and new gutters were installed. The second stage involved the building MWRL 100mm out of the re-purposed drain pipes, a water gun, water pump and concrete pedestal. The sculpture travelled to Sarajevo to be exhibited at the Historical Museum of Bosnia Herzegovina (June – August 2018) and will eventually return to Banja Luka to be permanently installed in the garden of the former military base (now art school) in an area that was previously used for tanks and motorised units drills. Miljanovic’s work is rooted in his own life experience of growing up during and after the war and his military training and service. Through his art he seeks to confront the past and make a practical contribution to the present, re-affirming the need to ‘make art, not war’. In his performance, photography and installations he seeks to re-define forms of social trauma, developing strategies whereby art serves society. MWRL 100mm builds on his 2006/07 work, ‘I Serve Art’ which was situated in the same space of the former military base, now Academy of Arts. In this piece of radical performance art he put himself in voluntary isolation within the site for 9 months, 247 days (the same duration as his time in the national service). MRWL 100mm on The History Museum of BiH. June 2018.